Festive food hampers have been handed out to 24 deserving members of Sleaford area’s Royal British Legion branch. The annual event saw Legion members delivering baskets of food to make it a merry Christmas for some of the most deserving, housebound members of the branch. The baskets are made up by delicatessen staff at Four Seasons Garden Centre and branch chairman Clive Candlin was appreciative of the shop’s continued support. The branch made a £3,000 profit from this year’s Poppy Prom, and received a £12,000 donation from the now defunct Rauceby War Weekend. Mr Candlin said £6,000 of that has gone to their welfare fund (which funds all local work) and £6,000 to the Poppy Appeal. The previous year (October 1, 2014 to September 30, 2015) the branch raised just over £26,000 for the Poppy Appeal. 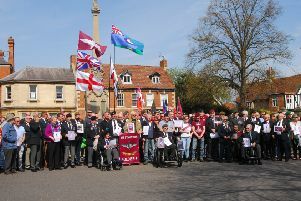 After only two months this year, they have already reached £34,000, meaning they are £2,000 up even without the war weekend.